The qualified decolorized palm oil enters into the spiral plate heat exchanger to recover most of the heat, and next goes to high pressure steam heat exchanger to be heated to the process temperature of 240-260 degrees Celsius, and then enters the deodorizer tower. 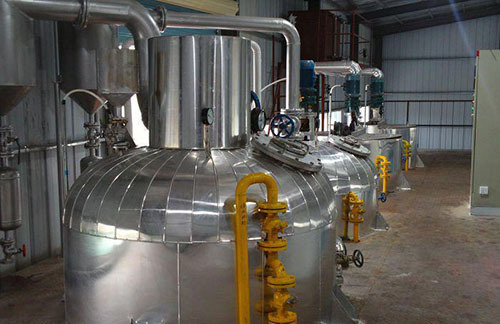 The upper layer of combined deodorization tower is the packing structure that is mainly used to remove the odor producing components such as free fatty acid (FFA). The bottom layer is the plate tower which is mainly for achieving the hot decolorizing effect and reducing the peroxide value of the oil to zero. Crude palm oil from the deodorization tower enters into the heat exchanger to recover most of the heat and makes further heat exchange with crude palm oil, and then is cooled to 80-85 degrees Celsius through the cooler. Add the required antioxidant and flavor agent, and then cool the palm oil below 50 degrees Celsius and store it. The packing catcher separates such volatiles as FFA from the deodorizing system, and the separated liquid is FFA at low temperature of 60-75 degrees Celsius. When the liquid level in the temporary tank is too high, the oil will be sent to the FFA storage tank.